For the surname, see Nuthall (surname). 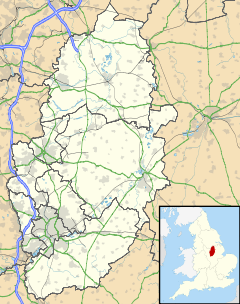 Nuthall is a village and civil parish located in Nottinghamshire, England, neighbouring Kimberley, Watnall, Cinderhill and Basford. The population of the civil parish at the 2011 census was 6,311. It is part of the borough of Broxtowe. Nuthall is split into two areas, Old Nuthall, which lies between the Nuthall Island roundabout and Kimberley, and New Nuthall, which lies between Bells Lane and Nuthall Island. New Nuthall also includes the Mornington Crescent Estate, a late 1980s/early 1990s exclusive development which borders Strelley and the Hempshill Vale estate and occupies the former site of Assarts Farm. New Nuthall also borders Broxtowe Country Park and a bypass road (Woodhouse Way). New Nuthall is largely detached 1960s/1970s houses situated on the Cedarlands/Horsendale estate. New Nuthall also includes the suburban housing estate known as Mornington/Assarts Farm. The estate has a popular school, a doctors surgery, and shop complex as well as a pub/restaurant, an Indian restaurant, making the estate largely self-contained. Nuthall Temple (now demolished) was the stately home of the Holden family. Papers of the Holden family are held at the department of Manuscripts and Special Collections, The University of Nottingham. The parish church is dedicated to St Patrick. ^ "Civil parish population 2011". Neighbourhood Statistics. Office for National Statistics. ^ Johnson, Alexander (2003). A History of Nottingham Suburbs. Nottingham: Lioness Printers. p. 92. ^ Johnson, Alexander (2003). A History of Nottingham Suburbs. Nottingham: Lioness Printers. p. 98. ^ Johnson, Alexander (2003). A History of Nottingham Suburbs. Nottingham: Lioness Printers. p. 89. This page was last edited on 22 October 2018, at 19:56 (UTC).